Poker players and fans alike have been left stunned by Austrian tournament director – and semi-pro player – Thomas Kremser’s decision to break all ties with the European Poker Tour (EPT) after he and his floor staff team have been ever-present at all EPT events, starting with the €1,000 buy-in main event at the Barcelona Open back on September 18, 2004. In addition to his EPT duties, Kremser has taken charge of poker tournaments on the World Poker Tour (WPT), Late Night Poker, William Hill Poker Grand Prix, and others, while he is also the owner of the Concord Card Club in his home town of Vienna. Probably the most respected of all poker tournament directors, the International Poker Federation (IPF) chief executive and TK Poker Events founder is looking for a new challenge after seven years of working with the EPT and their sponsors, online poker site PokerStars. Kremser oversaw his last EPT tournament just a few weeks back at the Grand Final of season seven in Madrid, but said that he felt the “time is right to explore new adventures”, while also believing that it was time to “adjust our business model to emphasise closer co-operation with licensed casino operators”. That decision has certainly come as a major surprise to countless poker pros, but it appears Kremser – a well-known face on television and in casinos around Europe – spoke to PokerStars “several weeks ago” to inform the online poker room that he felt the need “to review the nature of their relationship”. This seems to suggest Kremser – who was handed the European Poker Awards’ Lifetime Achievement in 2007 – and his staff have been startled by last month’s ‘Black Friday’, when PokerStars, among other well-respected US poker sites, was shut down by the US Department of Justice with allegations of money laundering and illegal gambling being leveled at the sites. As a result, TK Poker Events – which was the tour’s official consulting company – is no longer associated with the EPT, from immediate effect, and negotiations between the two parties over future events have now been ended. This is most definitely a massive blow to the EPT as the schedule is drawn up for season eight of the tour after witnessing healthy increases in attendances during the season just ended. 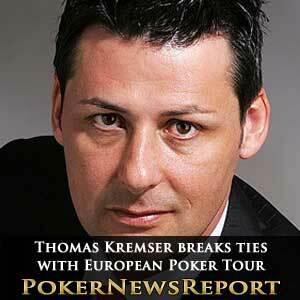 However, Kremser – who was the EPT’s event executive director – remains optimistic about the future, saying he is “excited about exploring new vistas and growing treasured relationships with casinos that have come to rely on TK as the face of professionalism, integrity and exceptional service in poker tournament operations and consulting matters”. This parting of the ways probably couldn’t have come at a worse time for the EPT as PokerStars will likely struggle to locate a suitable tournament director and dealers in time for season eight of the tour, which is due to begin in just a few months.